Director Paul WS Anderson has made a career out of making real dumb movies based on genre properties. Alien vs Predator. Resident Evil. Death Race. None of these films are particularly good, but in each of them there are flashes of Anderson’s sheer love of the insane things only cinematic adrenaline rushes can deliver. With The Three Musketeers, Anderson has finally crafted his masterpiece. All the elements found in Anderson’s oeuvre—intense violence, slapstick comedy, ridiculous plotting, scenery chewing actors—can be found here, but for once the bizarre concoction works like gangbusters. Anderson re-imagines Alexandre Dumas’ classic heroes as a trio of 17th century super spies that rely on whiz bang gadgetry as much as their wits and swordplay. Dumas’ central concept is still at play (Cardinal Richelieu hatches a plot to usurp the King, the Musketeers intervene) but Anderson cranks it up with the contemporary cinematic language Guy Ritchie used in the Sherlock Holmes films. Unlike Sherlock Holmes though, Three Musketeers knows how silly it’s being and never takes itself too seriously. The major key to this is the ensemble cast, most of whom know exactly the kind of movie they’re in. The titular heroes are played with great swashbuckling bravado by Matthew Macfadyen, Ray Stevenson, and Luke Evans. Christoph Waltz has the time of his life as the scheming Richelieu. Milla Jovovich nearly steals the film as the double crossing femme fatale Milady de Winter but Orlando Bloom swipes it away first as the over-the-top Duke of Buckingham. The only cast member that doesn’t seem to be in on the joke is Logan Lerman as D’Artagnan. Lerman scowls his way through the picture as if it’s a gritty reboot, missing the point entirely and coming across as little more than an ignorant brat. Fortunately the film’s action heavy pacing barely has patience for D’Artagnan. Screenwriters Alex Litvak and Andrew Davies have little time for the D’Artagnan story we all know like the backs of our hands when there are airships and conspiracy theories to indulge in. The film works best when it strays into the heightened camp inherent to the material, and Anderson has true talent for getting camp across without winking too much at the audience. Overall I’m surprised by The Three Musketeers, and it’s the best kind of surprise a critic can get. It is impossible not to walk into a film with expectations based upon the talent involved and their previous work, and I expected another muddled failure from Anderson. But the director has finally delivered the cinematic fever dream he always wanted to give us, and I was quite taken by it. This isn’t a great film or even a very good film, but it’s a fun film, the kind you can watch over beers with friends or on a Saturday afternoon with your kid. Three Musketeers is simple, silly, and it succeeds at everything it tries to do. It’s hard to find fault with a film that meets all its own expectations. 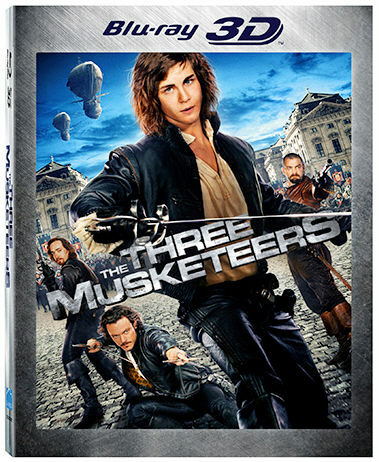 The Three Musketeers comes to BluRay on March 13th, 2012. You can pre-order a copy right here. Comments for BluRay Review: “The Three Musketeers” Is Campy Fun are now closed.